A fortnight after having achieved the N.A.I.A. 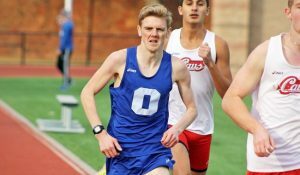 ‘A’ standard over 5000 metres Lothian Running Club’s Max McNeil has now acquired a similar standard over 3000 metres with a PB run. Competing in the Pittsburg State Indoor Gorilla Classic McNeil, who was running for the Oklahoma City University finished in 8th place in a time of 8 minutes 29.95 seconds which was well inside the A standard time of 8m 40s. His time was also the quickest he has run over the 3000 metres distance, bettering his previous best of 8:35.83 set at a BMC meeting in Glasgow in August 2014. Next story Hannah makes ‘A’ final at Scottish School Championships.